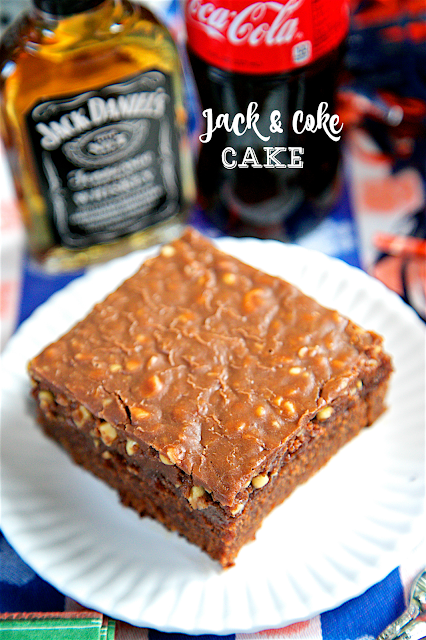 Jack and Coke Cake - our favorite drink in cake form! Homemade buttermilk chocolate cake and fudge frosting spiked with Jack Daniels. SO good! 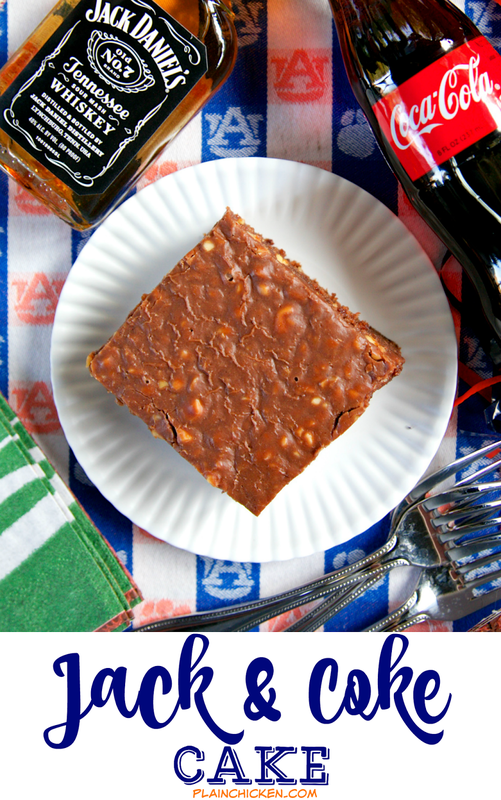 Great for a potluck and tailgate party! College football is over, but we still have the NFL to watch! Thank goodness!! 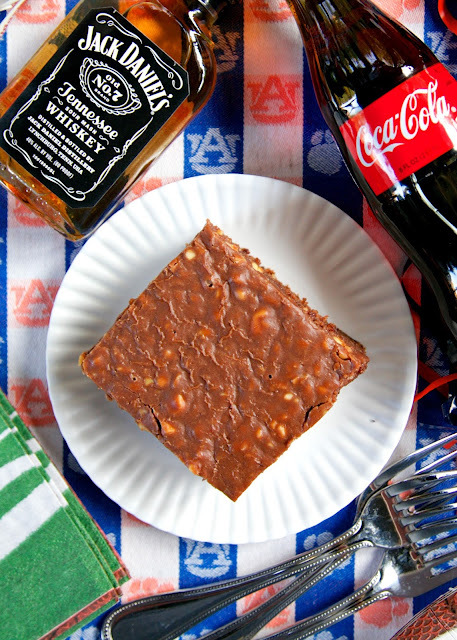 This Jack and Coke Cake is perfect for watching football. It takes one of our favorite drink combinations and puts it in cake form. YUM! There is Jack Daniel's and Coke in the cake and in the frosting. The flavor of the Jack Daniel's isn't overwhelming. It is very subtle; you can certainly add more if you want a stronger whiskey flavor. We loved this cake. What's not to love? 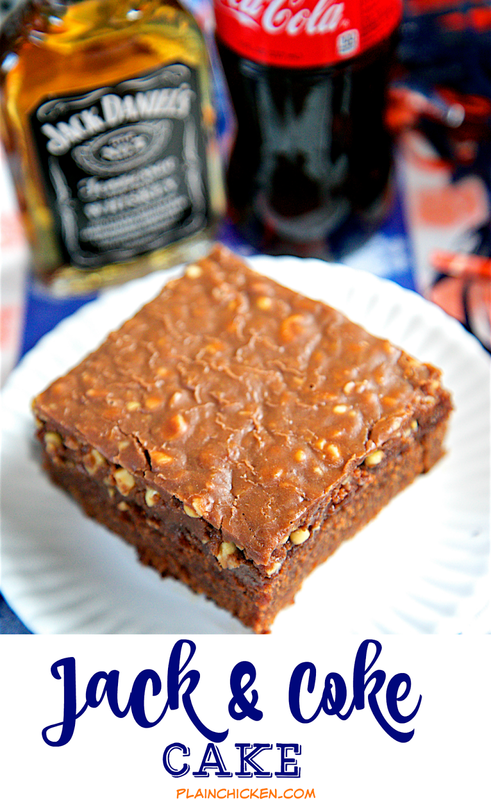 Chocolate, peanuts, Jack Daniel's and Coca-Cola. This cake is great warm or at room temperature. Add a big ol' scoop of vanilla ice cream to really put this cake over the top! You can make this cake a few days in advance - it will keep several days covered. Preheat oven to 350ºF. Grease a 9x13-inch pan. Set aside. In a bowl, combine sugar, flour and marshmallows. In a saucepan, mix the butter, oil, cocoa and Coca-Cola. Bring to a boil and pour over dry ingredients; blend well. Dissolve baking soda in buttermilk. Add buttermilk mixture, eggs, vanilla and Jack Daniels to chocolate batter, mixing well. Pour prepared pan. Bake 35 to 45 minutes. Remove from oven and frost immediately. To make frosting, combine the 1/2 cup butter, 3 tablespoons cocoa, and 1/4 cup of Coca-Cola in a saucepan. Bring to a boil and pour over confectioners' sugar, blending well. Add vanilla extract, 3 tablespoons of Jack Daniels and peanuts. Spread over hot cake. When cool, cut into squares and serve. What a fun cake...and certainly a party cake for sure! D-lish I sure!